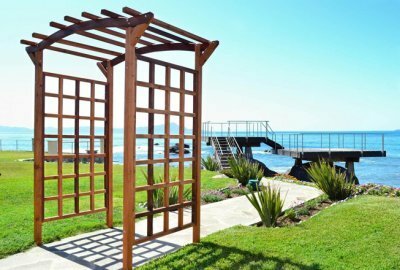 When it comes to custom made Redwood furniture, our wood arbor kits are one-of-a-kind. Make a unique space on your property without taking up too much space, and all the while adding style and function to your yard, patio, or pool area. We make each arbor kit customizable to your individual needs and style requirements. Take 5 minutes and call (866) 332 2403. Let us show you how easy it is to build your dream yard. An Arched Garden Arbor is more than decoration; it’s a transformative addition to your property that will last decades. 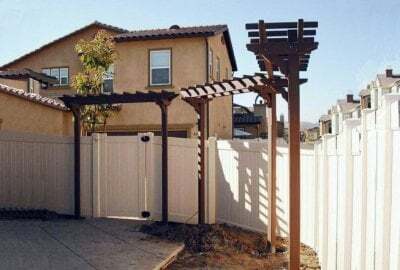 Because of the wood quaility we insist on and the amount of wood we use, we can confidently say we offer the long-lasting all natural wood Arbor Kits for sale anywhere. Hope you agree. Yes, any size you need. Sometimes you just need a place to relax and our Garden Arbor Bench, made from custom wood arbor, is the perfect choice for your yard and garden. These benches are comfortable, stable, space-efficient, and styled to fit your needs. You can even install them on enclosed patios or small walkways! Every house needs a nice entrance, and our Custom Made Wood Entryway Arbor Kit for sale can be the perfect match for your house or business. Place it in front of your front door, side entrance, or patio/back yard entrance, and instantly add style and depth to your property. These Entryway Arbor kits are simple, unassuming, beautiful, and sturdy. 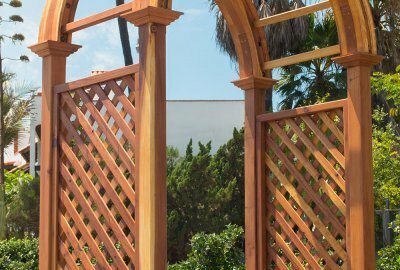 An Arched Arbor Trellis Kit with two posts sounds like a mouthful, but this subtle, dynamic Forever Redwood kit can be the perfect addition to your house. 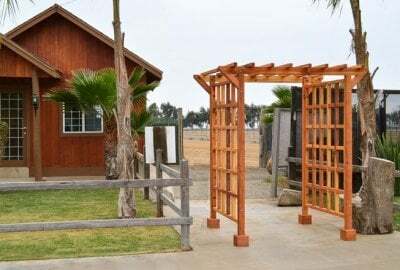 Much like the classic wooden gateways of Japan, two-post Arched Arbor Trellises provide a wide space open gateway to adorn your garage, driveway, or garden. The Versailles Arbor is our most decorated arch entryway arbor. It is a small but transformative addition to your property that will last decades. At Forever Redwood, we offer the best natural wood arbors available on the market today. Put this beautiful arch in your garden, on your walkway, patio, in your back yard, or as the entrance to your business. Its style and functionality is unmatched. Your garage is an integral part of your house and our Garage Arbor kits are the perfect compliment to adorn it. 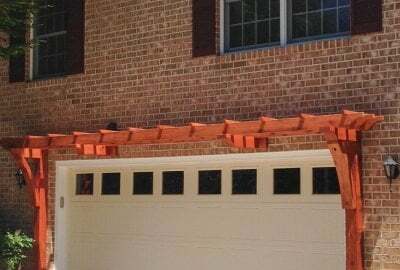 Make a simple addition into a lasting piece of your home’s aesthetics and greet yourself each day with this beautiful, custom-made wood Garage Arbor kit, shipped right to your door in just a few days. Our stunning hand-crafted woodwork is durable and guaranteed to last a lifetime as a beautiful addition to your garage.